"Abstract Classicist painting is hard-edged painting. Forms are finite, flat, rimmed by a hard, clean edge. These forms are not intended to evoke in the spectator any recollections of specific shapes he may have encountered in some other connection. They are autonomous shapes, sufficient unto themselves as shapes." Hard-edge painting is a tendency in late 1950s and 1960s art that is closely related to Post-painterly abstraction and Color Field Painting. It describes an abstract style that combines the clear composition of geometric abstraction with the intense color and bold, unitary forms of Color Field Painting. Although it was first identified with Californian artists, today the phrase is used to describe one of the most distinctive tendencies in abstract painting throughout the United States in the 1960s. Hard-edge abstraction was part of a general tendency to move away from the expressive qualities of gestural abstraction. Many painters also sought to avoid the shallow, post-Cubist space of Willem de Kooning's work, and instead adopted the open fields of color seen in the work of Barnett Newman. Hard-edge painting is known for its economy of form, fullness of color, impersonal execution, and smooth surface planes. The term "hard-edge abstraction" was devised by Californian art critic Jules Langsner, and was initially intended to title a 1959 exhibition that included four West Coast artists - Karl Benjamin, John McLaughlin, Frederick Hammersley and Lorser Feitelson. Although, later, the style was often referred to as "California hard-edge," and these four artists became synonymous with the movement, Langsner eventually decided to title the show Four Abstract Classicists (1959), as he felt that the style marked a classical turn away from the romanticism of Abstract Expressionism. In the late 1950s, the Californian art critic, poet and psychiatrist Jules Langsner began to observe an emerging trend in abstract art that stemmed from Color Field Painting, yet tended to employ clean lines and contrasting hues. He chose to highlight this by staging an exhibition at the Los Angeles County Museum of Art, in 1959, which included artists Frederick Hammersley, Karl Benjamin, John McLaughlin and Lorser Feitelson. It was titled Four Abstract Classicists. Considered one of Benjamin's signature paintings, Black Pillars has won new renown after becoming a centerpiece of the recent traveling exhibition Birth of the Cool, organized by the Orange County Museum of Art. Benjamin's use of somber blues, his sleek forms and shadow play are now considered emblematic of post-war American style. Although some of Benjamin's color forms in Black Pillars recall the form of old television screens, the artist was doing nothing more than playing with opposing colors and forms to create a visually engaging picture. Hammersley's Opposing #15 contains the visual symmetry often associated with post-painterly abstraction and Color Field Painting, but it lacks any sort of color interaction or balance. 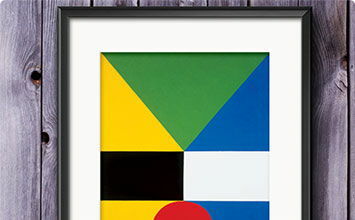 Hammersley pitted contrasting colors (mainly primaries) against each other, along with basic geometric forms that seem to have no business interacting. The end result displays one of the defining characteristics of many hard-edge paintings, which was the presence of rich and saturated color, clean lines, and flat surface, and a disregard for relationships between the colors that comprise the painting. All this suggests the shift in interests that took place as Color Field Painting ceded to Post-painterly abstraction; preoccupation with the expressive power of color gave way to interest in optical phenomena. Feitelson's Dichotomic Organization could be called a hard-edged interpretation of a Clyfford Still painting. The sharp color forms and hot-vs.-cold themes recall Still's own brand of Color Field Painting, while Feitelson's sense of dimension all make this a very unique work in the catalog of hard-edge paintings of the late 1950s and early 1960s. Jules Langsner once referred to Feitelson's work as containing "nothing ambiguous or fuzzily subjective." In other words, Langsner perceived Feitelson to be an artist with a stunningly clear vision, which was to create captivating art without any indication of the artist's perspective. Although generally hard to gauge, McLaughlin may be the least well known of the four abstract classicists, or California hard-edge painters. While having no signature style of his own, McLaughlin was a master colorist and composer of minimalist nonobjective paintings. His Y-1957 was among the early hard-edge works (although the term "hard-edge" has yet to be coined) that caught the attention of Langsner and prompted him to gather like-minded artists in an effort to highlight this new phase in West coast-based abstract painting. This simple stripe painting not only subtly played with the fundamentals of visual symmetry, but also predated the more well-known stripe paintings of Kenneth Noland. Stella was among the New York-based hard-edge painters who caught the attention of Jewish Museum director Alan Solomon, who would later curate the well-received Second-Generation Abstraction in 1963. Hyena Stomp is typical of his move towards color after his famous emergence with the Black Paintings. It balances four converging forms to suggest a complex prism of color; upon closer inspection one notices that the painting is completely asymmetrical. Robert Irwin was not associated with the original group of California hard-edge painters, but the breadth of his early work indicates a loose kinship with their stunningly simple compositions. Irwin's disc series, which includes the above untitled work, played with subtle degrees of light and perspective. What he achieved with these works was to take the components of hard-edge and post-painterly (art composed of basic shapes, colors, lines and geometric forms) and re-interpret them within a three-dimensional space. Untitled also took the tenets of Color Field Painting, wherein colors interact and cover an entire space, and re-interpreted it so that people were now interacting with the shapes, lines, and form of the artwork itself.